As students and former students know, the clinical instructor (CI) has a huge impact on the experience of a clinical affiliation. As I reflected on all of the CIs I worked with during my PT school internships, some patterns emerged in the styles of teaching used in the most constructive and formative experiences. A great clinical instructor can influence physical therapy students far beyond their clinical rotations. The best experiences I had as a student were preceded by a conversation with my clinical instructor. The most helpful thing I found to discuss beforehand pertained to my learning style. I happen to be a very visual learner – so I learned best when I was allowed to observe a new skill being performed correctly once before I was asked to perform it. In contrast, I had multiple classmates tell me in glowing terms about how they were “thrown in” on their first or second day of an affiliation – they only learn by doing. This one is huge. With the difference in experience, repetition of hands-on skills, and continued education, there’s no way a student can become a copy of a CI in 8 or 12 weeks. So instead of approaching the internship with the goal of teaching me to treat just like my CI, I had some teachers who seemed to remember how they got to where they are, and taught me how to start on that path. This isn’t applicable to all clinicals, but one of my CIs in an outpatient orthopedic clinic had a very helpful habit. If a patient no-showed and I was caught up on documentation, my CI would have me watch educational videos from sites like MedBridge or Modern Manual Therapy. I would then practice the relevant techniques. It was helpful to have a teacher offer to use canceled treatment times for hands-on practice, as I often felt hesitant to ask, concerned that he needed those free blocks for paperwork. This method also challenged me to integrate new evidence and ideas directly into my practice during a very formative period when I was building my habits and paradigms as a clinician. This one can be tricky – but if you can find the balance it will do wonders for helping your student build confidence. If your student is about to run an appointment in a different order than you usually do, and there isn’t a safety or quality of care risk to changing up the order, let them roll with it. If it would have been a bit easier or more efficient to run the session differently, explain that after the patient leaves. The main idea here is the more you can minimize interruptions to the structure the student is choosing for the session, the better. I had one instructor who tended to think a bit differently than I did, but he would let me practice managing whole treatment sessions. Then while we were reviewing notes at the end of the day, he would ask me why I chose a particular intervention. If I could give sound reasoning, he would either drop the issue, or offer the intervention he had planned as a suggestion for future appointments. This can be as simple as acknowledging when a student picks an especially good intervention, or recognizing when they initiate some interdisciplinary communication without cueing. Especially when students are just beginning to be fairly independent, a lack of feedback may not be perceived as good feedback. 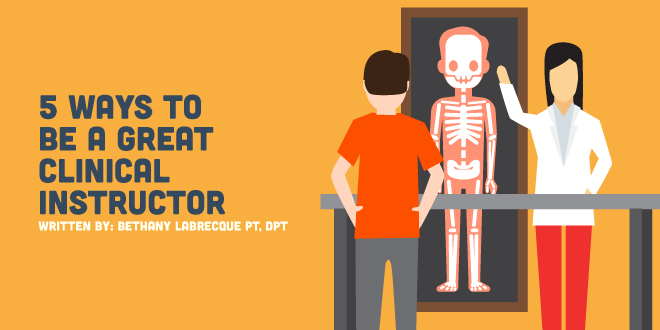 The average PT student is such a perfectionist that they will remember correction either way, and the first is non-threatening and actionable. A positive student/CI relationship can have a big impact, and I hope instructors remember that. I will always be grateful to my teachers – they were a big part of making me the therapist I am today. Instructors who are especially passionate about their role can be a wonderful influence – it’s amazing how much you can learn and how excited you can get about PT in just a few short weeks!